collectSPACE - news - "Ohio state quarters aboard Columbia"
March 18, 2002 — Ohio Governor Bob Taft joined U.S. Mint Director Henrietta Holsman Fore and U.S. Treasurer Rosario Marin today at the U.S. Air Force Museum to unveil the Ohio commemorative quarter-dollar coin, the 17th under the 50 State Quarters Program. Senator John Glenn, Neil Armstrong and Stephen Wright also spoke. The Associated Press reports that Armstrong, who was raised in Ohio and became the first man to walk on the Moon, "told the crowd that Ohio has been at the forefront of progress in flight for the entire century." He went on to say that "Ohioans will be delighted that the Ohio quarter recognizes that reality." 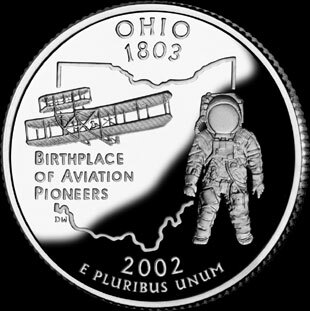 The Buckeye State quarter's design honors the state's contribution to the history of aviation, depicting an early aircraft and an astronaut, superimposed on the outline of the state. It also includes the inscription "Birthplace of Aviation Pioneers." In addition to Armstrong and Glenn, Orville Wright, co-inventor of the airplane, was born in Ohio. The state was host to where Wright and his brother Wilbur developed and tested their 1905 Flyer III. "From man's first airplane to man's first steps on the moon, Ohio is truly the birthplace of aviation pioneers. It is fitting that the Ohio quarter honors the technological achievements that have changed the world forever," the U.S. Mint Director, Fore said. Governor Taft selected the final design after the Ohio Commemorative Quarter Program Committee received and reviewed more than 7,000 design suggestions from across the state. U.S. Treasury Secretary Paul O'Neill approved the final design. Ohio just added another chapter to its aviation history earlier this month when astronauts Nancy Currie of Troy, Ohio, and Richard Linnehan, who both graduated from Ohio State University, carried four of the state's quarters into space on the space shuttle Columbia. Begun in 1999, the Mint's 50 State Quarters Program is a ten year initiative that honors each of the nation's states in the order they joined the Union. Each quarter is minted for only ten weeks and will never be produced again. It is estimated that more than 125 million adults are collecting the quarters. March 3, 2002 — Two astronauts with Ohio ties carried Ohio commemorative quarter-dollar coins into space on shuttle Columbia when it was launched March 1 on an 11 day mission to repair the Hubble Space Telescope. The Ohio quarter, the 17th in the U.S. Mint's 50 State Quarters Program, celebrates Ohio as the "Birthplace of Aviation Pioneers." More than 20 astronauts call Ohio home, including John Glenn and Neil Armstrong. Lt. Col. Nancy Currie and Dr. Richard Linnehan, DVM, also have Ohio ties and are members of the crew that lifted off into space on Friday. Currie was raised in Troy, Ohio, and graduated from Ohio State University. Linnehan also received his degree from Ohio State University. "I am delighted that NASA has chosen to send four Ohio quarters on space shuttle Columbia's mission that began this morning," said U.S. Mint Director Henrietta Holsman Fore. "Colonel Currie and Dr. Linnehan join an illustrious group, from Orville Wright and Eddie Rickenbacker, to John Glenn, Neil Armstrong and Judith Resnik, as Ohio's latest aviation pioneers." Placing the four quarters on the shuttle mission was a joint effort involving the U.S. Mint, the Ohio Bicentennial Commission, NASA, Ohio Governor Bob Taft and Sen. George V. Voinovich. When the quarters return to earth, Currie and Linnehan will keep one each and the other two will be donated to the U.S. Air Force Museum in Dayton, Ohio, where they will be displayed for the public. "Ohio's quarter pays tribute to the brave men and women who pushed aviation and space exploration further and further," commented Taft. "It is only fitting that two such pioneers are carrying these quarters as they continue in the tradition of other aviation pioneers." The Ohio quarter will be released into general circulation on March 11, with an official ceremony on March 18 at the Air Force Museum. The space quarters will be on display for the ceremony that will include U.S. Treasurer Rosario Marin, Mint Director Fore, Sen. Glenn and Taft.